Conductor : fine stranded very flexible copper, class 6. Electrical field control : inner and outer layers of semiconducting rubber. Inner sheath : special EPR compound. 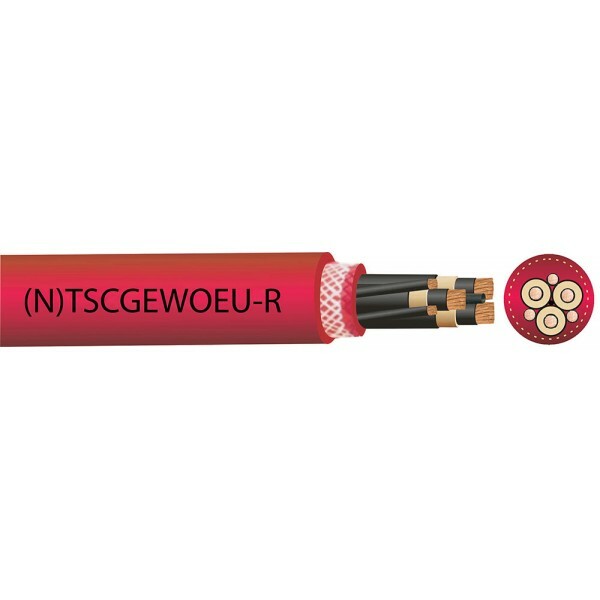 Rated voltage Uo/U : 3.6/6 to 18/30 kV. Test voltage (AC) : 11 to 43 kV. Max. voltage allowed (AC) : 4.2/7.2 to 20.8/36 kV. Max. voltage allowed (DC) : 5.4/10.8 to 27/54 kV. Max. short circuit temperature : 250° C.
Max. conductor temperature : 90° C.
Ambient temp. (static condition) : -40 to +90° C.
Ambient temp. (mobile condition) : -25 to +80° C.
Pulling stress resistance : up to 20 N/mm². Internal torsion resistance : +/- 100°/m. Drum rewind speed : up to 100 m/min. Operation speed : up to 60 m/min. Cable : DIN VDE 0250 part 813. Resistance to oil : EN 60811-2-1, IEC 60811-2-1. Bending radius : VDE 0298 part 3. Current rating : VDE 0298 part 4. Insulation : DIN VDE 0207 part 20. Inner sheath : DIN VDE 0207 part 21. Conductor construction : DIN VDE 0295 (IEC 60228). Outer sheath : VDE 0207 part 21. Flexible power supply cable for use in strip and open-pit mining facilities, for high mechanical stresses, designed for connection of large material handling machines such as excavators, dumpers or mobile crushers. Main application: operation on cable reels Its weather resistance is remarkable: it has unrestricted use indoors, outdoors, resistance to ozone, UV and moisture.